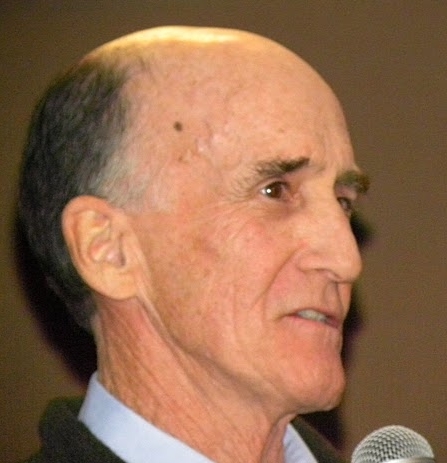 Catalina High School Tucson, Arizona Class of 1959 Classmate HAL LANDON, JR. Note: The material here was not supplied by Lanny, it was created by your webmaster. Lanny is much to humble to brag on himself. Hal Landon, Jr., or Lanny as we all knew him at CHS, was the highlight of the evening at the celebratory dinner of our 50th reunion. His Bob Newhart skits were hilarious. Of course, that's what you would you expect from a professional performer who has appeared on the stage, screen, and television for many years. Lanny has been in the movies, most notably as the father, Captain Logan, in Bill & Ted's Excellent Adventure among many other roles. On the small screen, you've seen him on Frasier, Newhart, HIghway to Heaven, and Dallas to name just a few. He also has been a Southern California favorite by appearing as Scrooge in Dickens' A Christmas Carol every holiday season for 29 years at the South Coast Repertory Theatre. Lanny currently is an instructor in the Drama Dept. at Long Beach City College. Thanks, Lanny, for entertaining at our reunion. Congratulations on your success! For a complete list of Lanny's credits, check out the Internet Movie Data Base HERE. Lanny at the microphone after dinner at our 50th reunion. 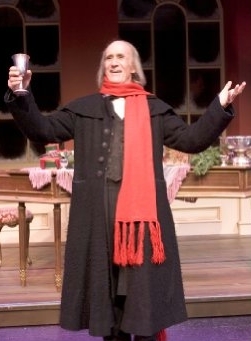 Lanny has appeared as Scrooge for 29 years in a row in Dickens' A Christmas Carol.